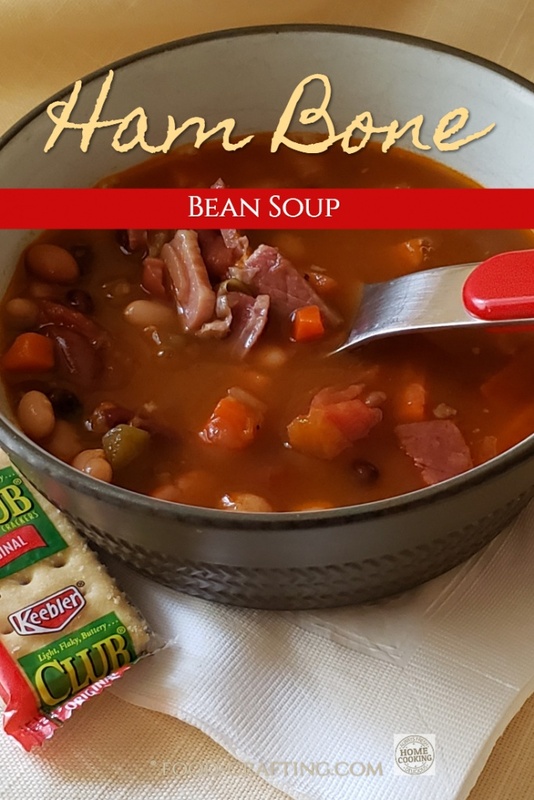 Ham Bone Bean Soup – I was determined to participate in the Honey Baked Ham® “buy a ham bone and get a soup mix” special but I’m a week too late. Not sure where last week went but today, I bought the ham bone and got much more than I anticipated. Much more ham on the bone and a real deal. I also discovered while talking to the store clerk that the ham bone special was a great success. With the ugly weather we’ve had, I’m not surprised. 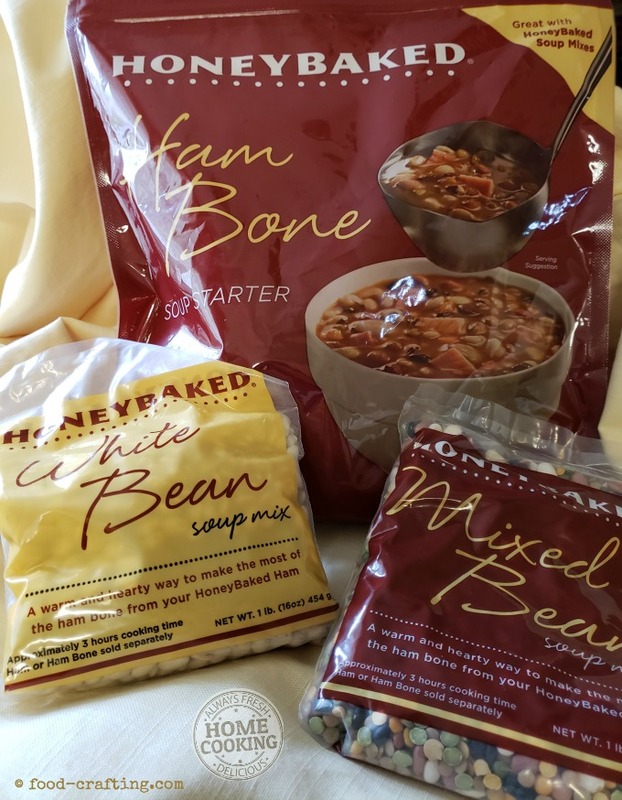 Several years ago, when buying a Honey Baked Ham® for Thanksgiving, I also grabbed a mixed bean soup mix. 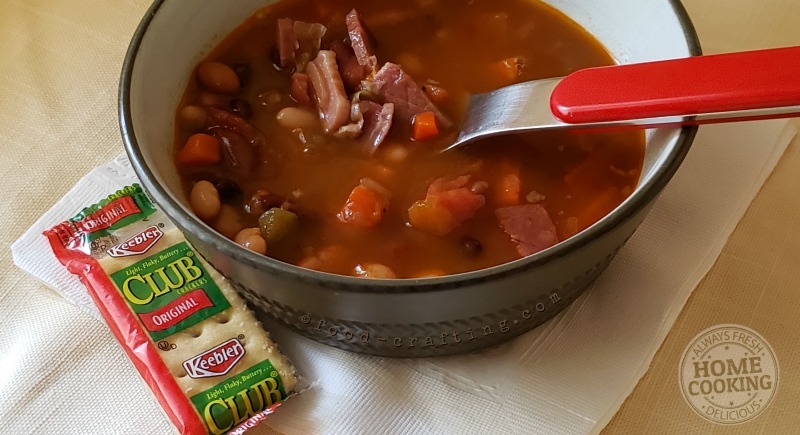 Mixed bean ham soup is now a traditional holiday weekend recipe. 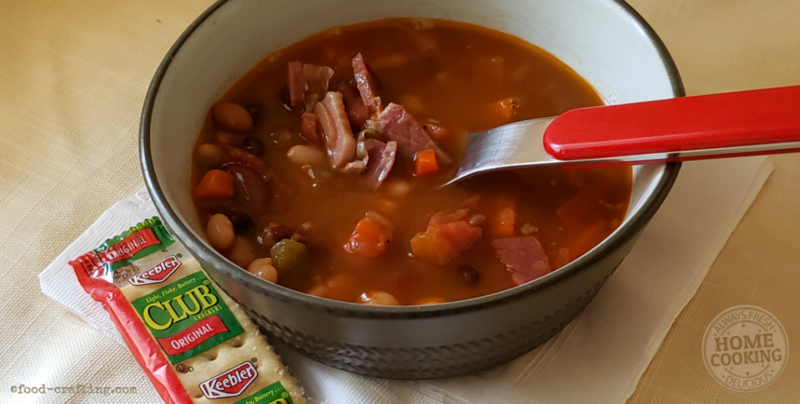 It’s a blustery day so why not purchase a couple servings of the original, store-bought container of ham and bean soup? Just to taste it? When I prepared the soup pictured above, I used the signature recipe on the back of the soup mix pouch. To the letter. After tasting the store version, it is obvious that it does not follow that recipe. Surely each “cook” adds their special touch. But there are several obvious differences between the soup mix and the prepared soup. According to the bag of mixed beans (contains Great Northern, Black, Red, Lentils, Green Split Peas, Yellow Split Peas, Pink and Lima), a serving size equals 1/4 cup. Seriously? My soup bowls hold 16 ounces! A quarter cup is more like a tasting sample in this house. Decisions, decisions. 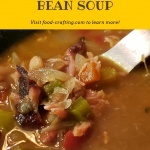 There is also a White Bean Soup Mix – all Great Northern beans. I bought a bag to see if I can make a homestyle version of Beans & Bacon soup. 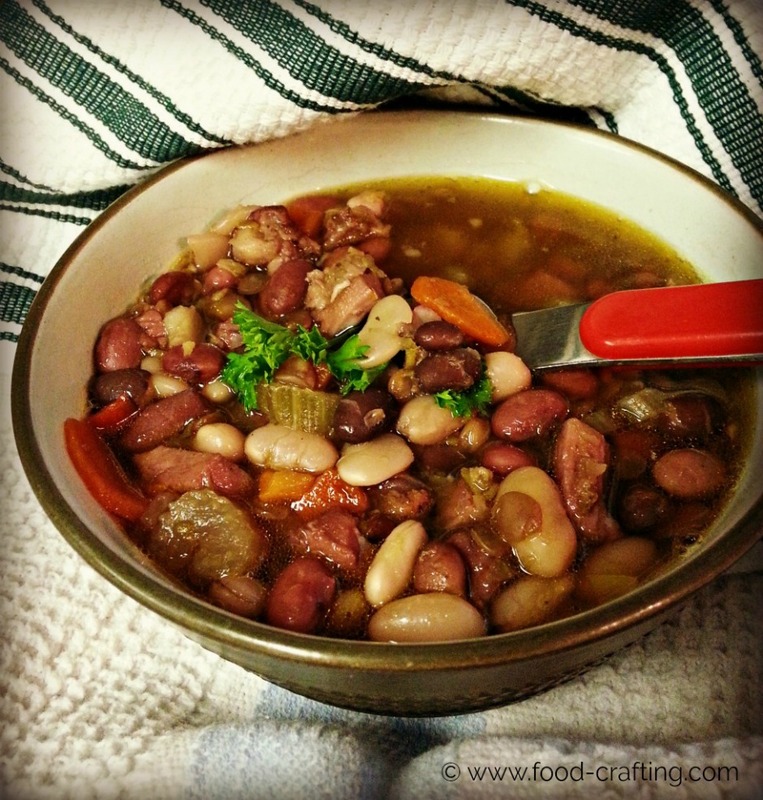 Another favorite chilly weather soup! Virtually no fat in beans. Plenty of carbs but where did the 410 mg of sodium come from? I do not recall a seasoning packet in with the beans but one is included as the package lists spices, salt, sugar, and dehydrated veggies. Add the ham and the sodium content climbs. How Does The Prepared Bean Soup Taste? The soup tastes great! It’s a generous serving for lunch. But here come my observations and reasons why I intend to tweak the recipe. Perhaps my goal to reduce the sodium content of recipes to the bare minimum is paying off. I also watch the calories. Let’s face it. Recipes just don’t taste good prepared without any salt at all. But when the DH comments on how salty food tastes then I know I am headed in the right direction. For me. it only took one spoonful to guesstimate the sodium content at HIGH! Cringe-worthy high. So, one would venture to guess that there is more than the 1/2 teaspoon of salt in the soup. Online Calorie Counter — Calorie counting made easy. Search from 100,000+ foods. Adding too much salt is easy enough to do when cooking in large quantities. So even if you are not making enough soup for a small army or just double the amount you would normally prepare, don’t automatically double the salt measurement. We love freshly cracked pepper but here too, adjust the seasonings to your liking after the soup has cooked for a while. Calculate the total amount of sodium in the combined ingredients. In this case, the seasoning pack already gives you 410 mg. of sodium. The recipe adds another 1/2 teaspoon plus a full teaspoon of pepper. A 3 oz. 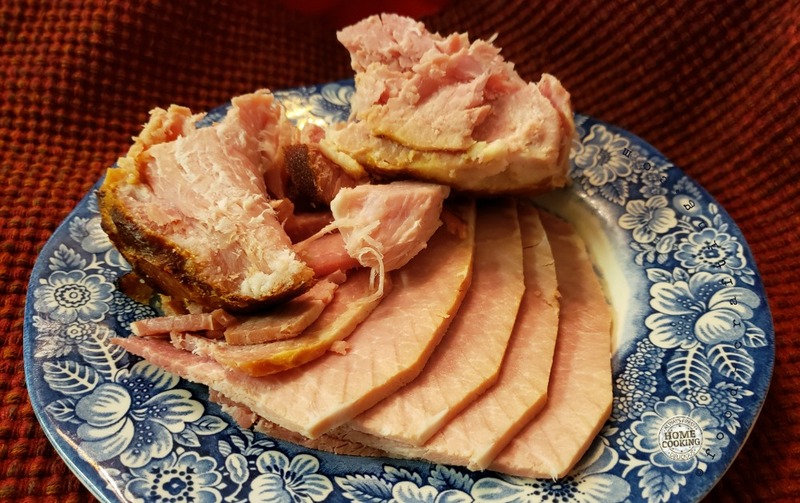 serving of ham has 15 grams of protein but 870 mg. of sodium! And considering the amount of ham left on the “soup bone”, I guarantee that you are adding several 3 oz. servings of ham to the soup. “One teaspoon of salt is equivalent to about 2,300 milligrams of sodium. The ideal daily intake of sodium is 1500 mg! You can always adjust amounts upwards but you can’t remove it once it’s in the soup. One of my hard-learned soup making lessons. Since my lunchtime bowl of soup contained more than the recommended 1/4 cup serving, I’ve already had more than my fair share for the day. How do I know? A 1 cup serving has 954 mg! Here are some of the ingredients that require adjusting in my opinion. Along with the seasoning packet, I would still use all fresh vegetables sautéed in real butter. Fresh herbs, freshly cracked pepper and a little salt. The store-bought ham bean soup was full of real veggies including sizeable bits of green bell peppers. The ham on the bone will season the broth sufficiently and everyone can adjust for personal taste. The soup can also be tweaked with the addition of fresh herbs to fresh vegetables. The ham bone in the soup starter pack was incredibly generous in size. The package does not specify a weight but rather a portion – 1. At less than $8., it is, in my opinion, too much ham for soup. Contents of the Soup Starter pack – That’s a lot of ham for soup! I removed at least 5 spiral slices and a couple sizeable chunks for ham salad. 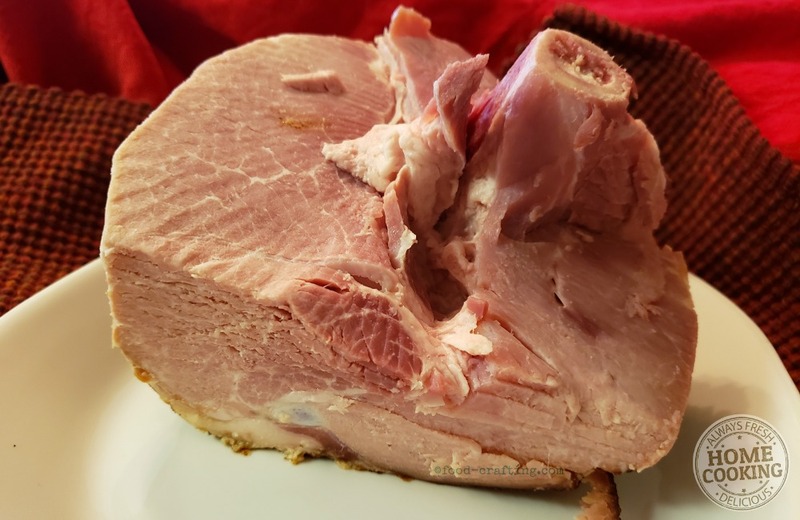 And there was still more ham on the bone than when I make soup with the leftover ham bone! Enough extra ham for sandwiches & ham salad! The signature soup recipe calls for 12 cups of water. That sounds like a lot of water but I usually add two to three containers of broth to soup veggies. That’s 96 oz. It seems like a lot of water but the beans will need to cook and plump up. If you compare my mixed bean ham soup to the signature store-bought soup, their broth is more than just water. Even the addition of the seasoning pack would not color the broth a bright tomato red. My recipe used ham broth. It still did not turn out like tomato soup. 2 tsp. Better Than Bouillon Ham Base = 680 mg. Tomatoes? It could be a whole can of crushed tomatoes added to the water or broth. An un-drained can of tomatoes. A splash of hot sauce to the broth for a spicy soup? Why yes! Time for the soup experiment. How close can I come to replicating the store bought soup? Did you buy a ham bone during last week’s special? How did you prepare the recipe? Let’s compare notes! 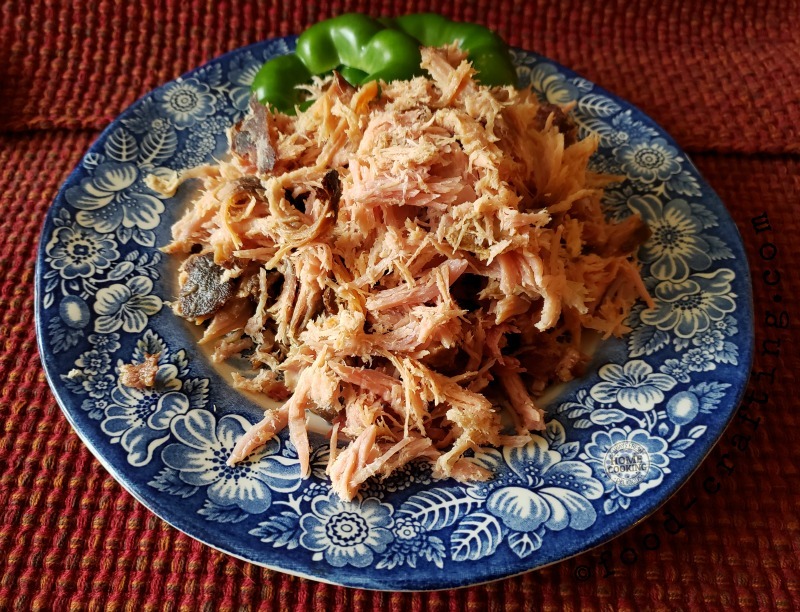 A good 4 cups of shredded ham for the soup! Could Not Duplicate The Store Bought Soup! I tried. Even added a few shakes of smoked paprika to see if I could come close to the bright red of the store bought soup. 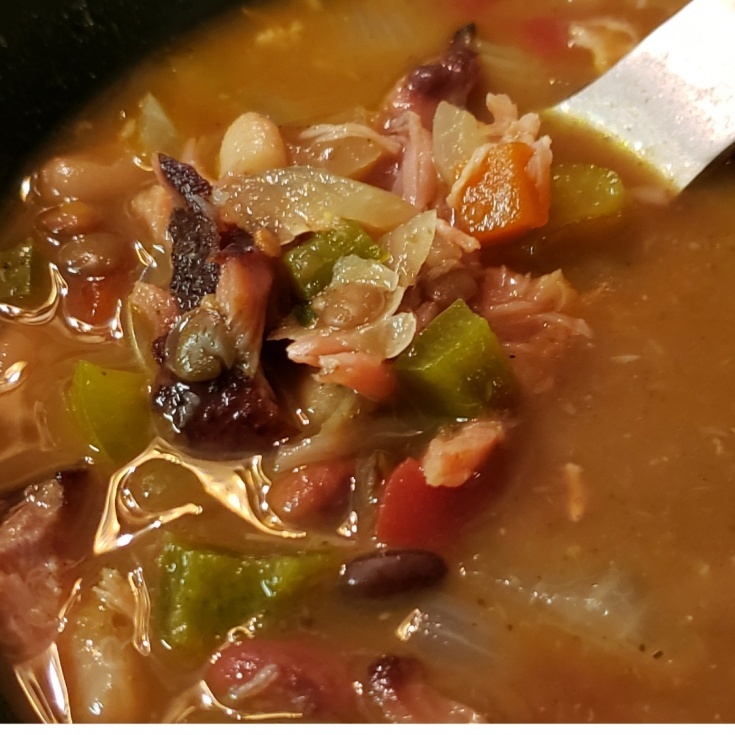 The soup has the same incredible flavor I recall but even with a few tweaks, my version of the Ham Bone Bean Soup does not look like the soup I bought. Here is my final recipe with all the adjustments. Result? A hearty soup. I always have leftover soup. On purpose. Nothing is easier than reaching in the freezer for a cup of soup. ===> Get your Souper Cubes. De's version of the Honey Baked Ham® style ham bone bean soup made with their ham bone soup starter pack. A delicious hearty soup for a cold winter evening. All you need is a grilled cheese sandwich and a side salad. Remove the excess ham from the bone. The soup started did not specify how much ham was included but it was too much for soup. Place the ham bone in a large Dutch Oven and cover with 12 cups of water. Bring the pan to a rolling simmer. Distribute the beans evenly around the ham bone and bring the water back to a steady simmer. Cover and cook for about 2 hours. Remove the bone to a platter. Allow to cool then pick off the meat. I had about 4 cups of ham. Add all the chopped vegetables to soup along with the shredded ham. Simmer for another hour or so until the vegetables are tender. Total Carbs = 32 g.
To verify the numbers, I entered both the specific foods and quantities in my Food Diary to calculate the recipe totals. To the 10 (instead of 12 cups) cups of water, I added two large vegetable bouillon cubes (or ham bouillon if you prefer) along with the seasoning pack. Only 14 ounces of diced tomatoes – undrained. I doubt a full 28 oz. of tomatoes would give me the red colored broth and I did not want this to be tomato soup! The recipe calls for 1/2 teaspoon of salt. I did not add any. The bouillon cubes have plenty of sodium. I added two fresh green bell peppers cut in small dice. Much less ham than on the bone. We made sandwiches with the slices! Not even close to the store bought soup but great tasting! How To Make Old Fashioned Ham Salad Spread– Make sandwiches with sliced ham or a home style ham salad spread. 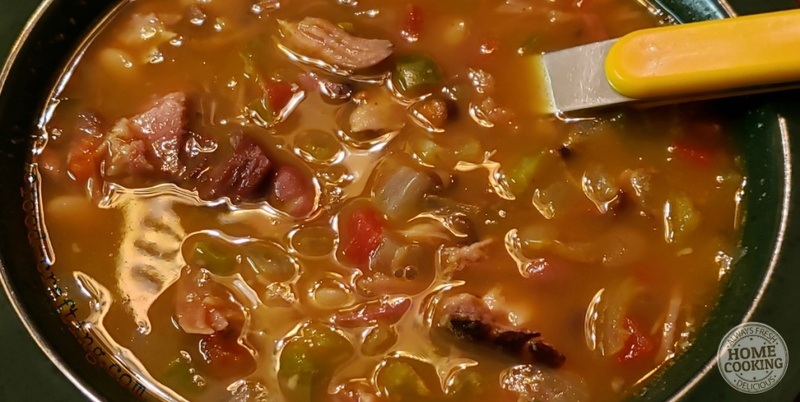 Best Ham Bone Bean Soup – Another easy ham bone bean soup to make with ham bones or leftover ham slices. This is the picnic ham that provided the ham bones for the soup! 0.3 How Does The Prepared Bean Soup Taste? 0.3.2 Salt: How Much Is Too Much? 0.5.1 Could Not Duplicate The Store Bought Soup!